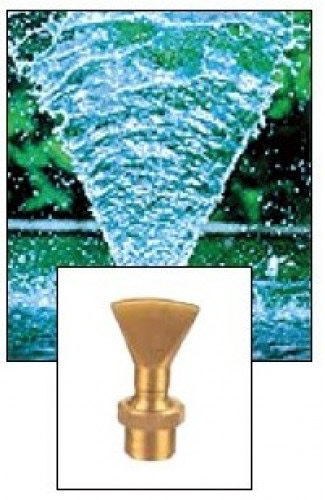 The brass Fan Jet nozzle creates an angled spray of fanning water. As the spray pattern arcs upwards it widens and cascades back to the pond in a wide splash pattern. The nozzle is not water level dependant and can be used to create dramatic effects especially when lighting is used to accentuate the liquid arch the nozzle creates. The thin outlet of the Fan Jet nozzle creates an interesting water film look. By adjusting the flow from your pump you can fine tune the thickness and spray distance of the catapulting water stream and the adjustable ball socket creates further options. Multiple nozzles can create stunning effects in formal ponds and cement basins in parks especially when creating a ring around a larger fountain or splashing towards the feet of a statue. Ensure that the hose or PVC tubing that connects your pump to the nozzle is a sufficient diameter. Always try to use a pipe with the same diameter as the nozzle to minimize loss of flow from pipe friction. The following chart is an approximate detailing of various spray heights with various pump flows at required head rating. Ensure your pump gives the recommended flow at the specified head (height). The Fan Jet nozzle is adjusted to any angle as it pivots on a ball socket that can be adjusted by loosening the collar which allows complete adjustment of the angle of the fannung spray which will influence the height and distance the nozzle sprays.